Croatia is becoming an increasingly popular summer destination for those wanting an affordable European beach vacation. With so many islands, you can choose the kind of experiences you want for your vacation — whether for relaxation, nightlife, outdoor activities, or food and wine. Each island has a rich heritage and its own distinctive cuisine, as well as activities suited to its unique geography. Departure for each of these four islands is from the coastal port city of Split, which has its own rich heritage, UNESCO listed sites, and great ferry network. 1. Brač — Climb a mountain or just watch the boats sail by. Just a short ferry ride from Split is the mountainous island of Brač, one of the largest and most accessible of the Adriatic islands. You can visit it by ferry as a day trip from Split or stay for a week or longer to enjoy the striking landscape and multiple outdoor activities. In fact, one of the most appealing aspects of Brač is the sheer range of possible experiences. You can relax on the beach in one of the many coves, hike through pine forests, or enjoy incredible views after summiting the 2,552-foot-high Vidova Gora, the highest peak on the Adriatic Islands. For a laid-back and more off-the-beaten-path vacation, stay on the north side of the island in Supetar, where a ferry from Split arrives all year. Alternatively, the island’s more touristy south side has more in the way of beaches, restaurants, bars, and accommodations. A great place to base yourself in the south is the seaside town of Bol. In the summer, a fast catamaran ferry connects Bol to Split; at other times of year, you can reach it via a bus from the ferry terminal in Supetar. For an upmarket vacation in Bol, you could stay at beach resorts like Bluesun Elaphusa or Zlatni Rat Beach Resort. Even if you stay in the heart of town, be sure to walk the short mile along a well-maintained path from town to Zlatni Rat beach, also known as the “Golden Horn.” It has an unusually shaped pebble beach, water sports, bars, and cafes. A fun, and more economical, lodging option in Bol is to stay in an apartment, so you can visit the local markets, bursting with seasonal produce, and cook. Bol also has several excellent seafood and pizza restaurants. In any case, spend an afternoon walking along the promenade and follow that by wine tasting at the local Ština winery. 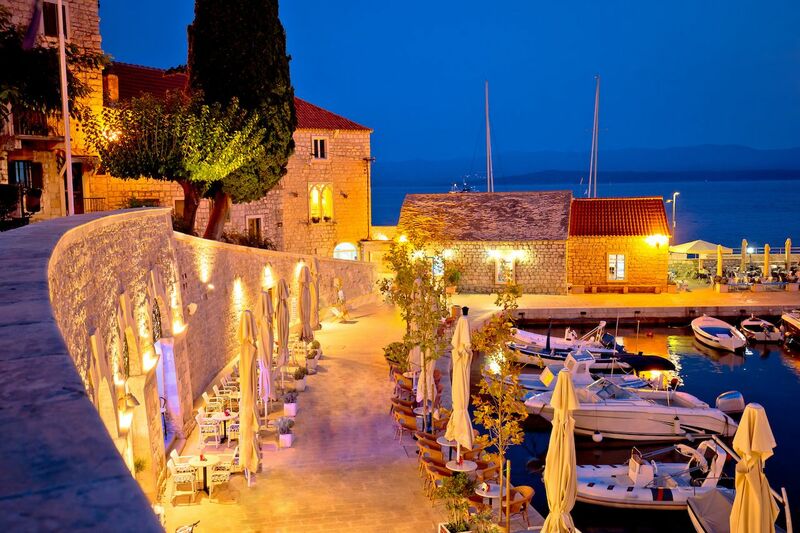 Ština is gloriously located on the waterfront, making it an ideal evening perch to sip wine made from grapes grown on the island and taste the local olive oil, sheep cheese, and olives, all while you watch the yachts come and go. 2. Hvar — Scooter from quiet beach coves to chic bars. 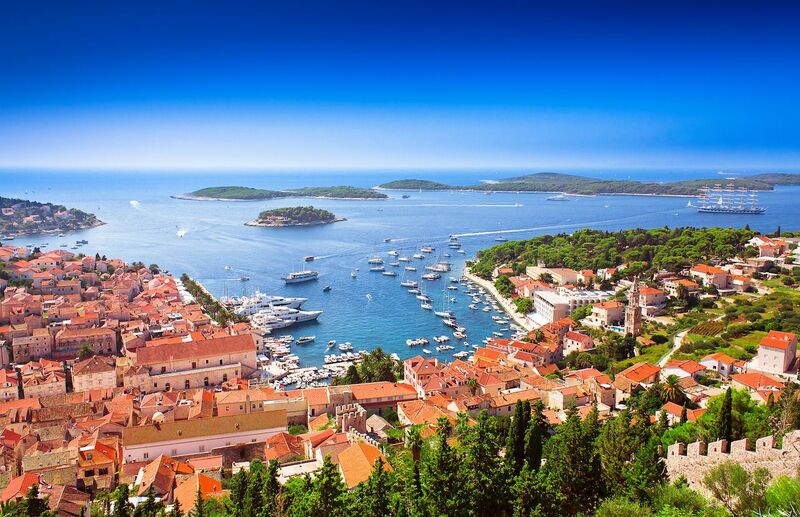 The most cosmopolitan and popular of the Croatian islands is Hvar. Chic hotels, upmarket restaurants, and fashionable waterside bars adorn the coastline, onto which is usually attached a luxury private yacht — or 10. If you love kicking back with an espresso (the Martini version) and celebrity-watching, this is the island for you. 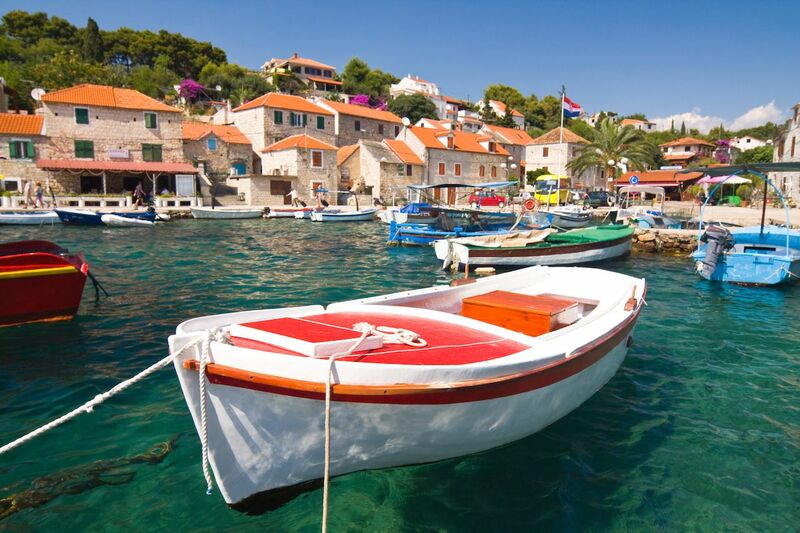 Most visitors aim for picture-perfect Hvar Town in the southeast. It’s the center for fine dining and nightlife and has a variety of accommodations, which fill quickly in summer. Under the protective gaze of a medieval hilltop fortress, the town is a maze of old stone houses and pedestrianized alleyways, which eventually lead down to a modern harbor. For a slower pace of beach life, head to the town of Jelsa on the north coast. There, you can find an affordable old stone apartment with a sea view and sit back and soak up the warmth. You could while away entire afternoons in Jelsa just wandering the alleyways and sampling the local wines; a visit to the Tomić or Duboković cellars is a must. If you visit the latter, be sure to ask for a taste of the incredible bold red, Medvjedica. Afterward, settle in for a meal at a konoba, a small inn like Konoba Turan for local, traditional dishes such as octopus peka, where the dish is usually slow-cooked for 24 hours. The next morning when you wake to yet another day of sunshine, nearby Mina beach is a great spot for a dip in the ocean. Regardless of where you stay, since the island is almost always sunny, one of the most fun ways to explore Hvar is by scooter. 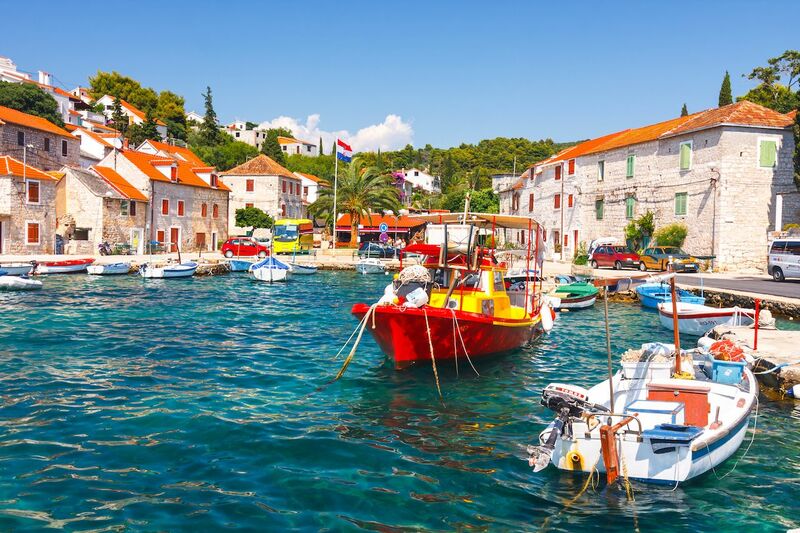 The island’s interior is hilly and rocky, hiding old abandoned settlements, fields of Hvar’s famous lavender, and hillside vineyards; the coastline, meanwhile, is peppered with pretty beach coves and sleepy fishing villages. 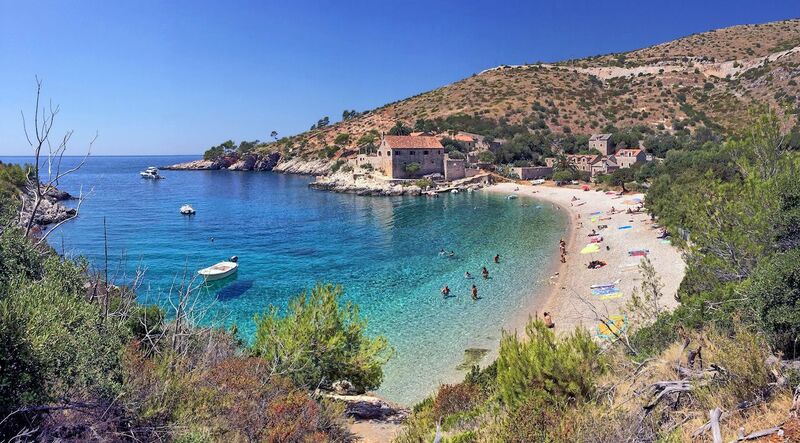 Five miles from Hvar Town in a picturesque cove is secluded Dubovica beach; it’s a lovely spot to while away the day, perhaps with a visit to the beach bar and restaurant to try out the local cheese and fresh seafood. Hvar Town can be reached directly from Split by a Jadrolinija catamaran or ferry, and you can get to peaceful Jelsa by a Jadrolinija ferry via Brač. 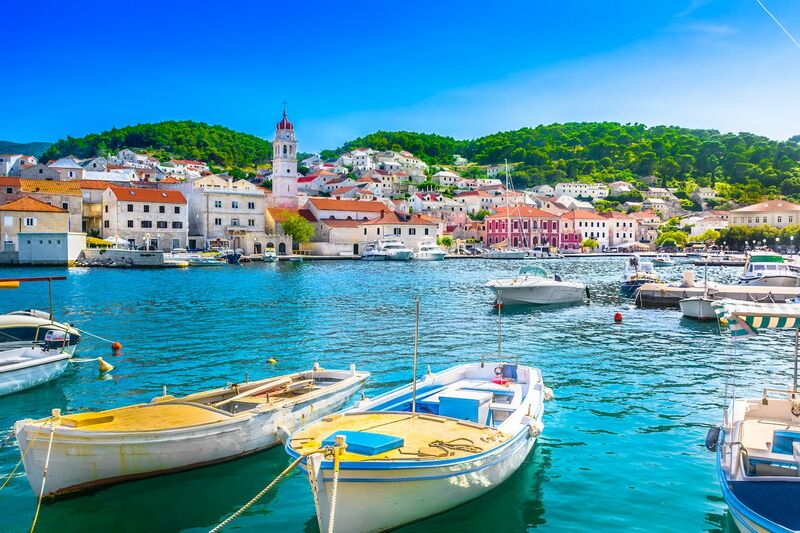 A discussion of the glamorous island of Hvar also seems like the appropriate place to add an indulgent private yacht charter into the mix of transport options. The Adriatic islands are situated closely together and well-suited to island hopping for the ultimate vacation treat. 3. Korčula — Cycle past olive groves and vineyards. Korčula is a little more time consuming to reach by ferry compared to other islands, but it’s worth the effort for its unique variation of island life and chill vibes. 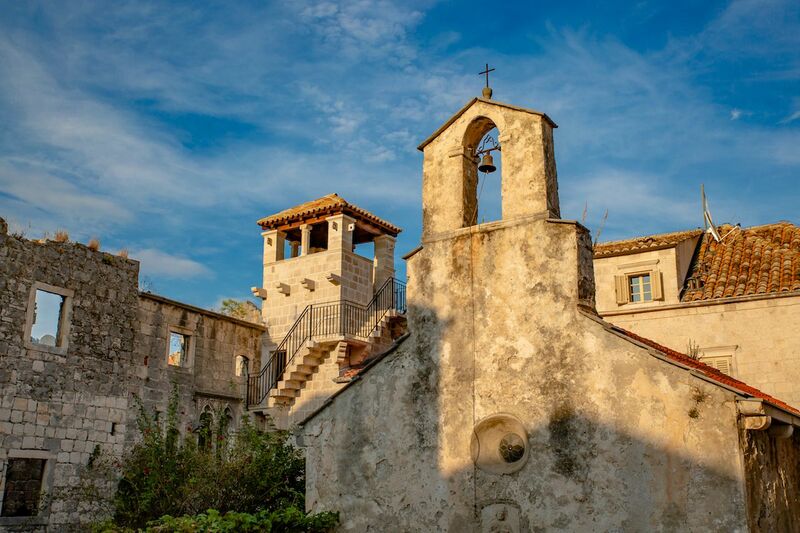 According to local legend, Korčula is the birthplace of famous explorer Marco Polo. Although the Venetians may disagree, the alleged site of his birth is a popular visitor attraction. 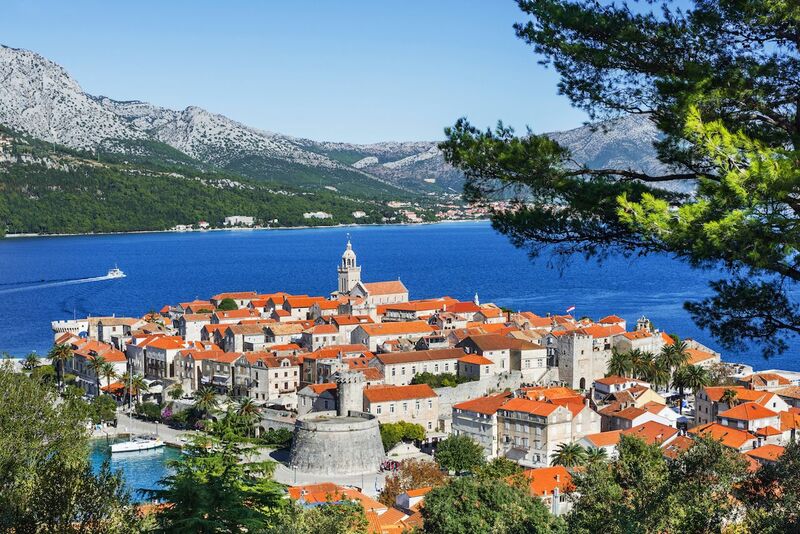 Korcula town is the most versatile place to base yourself — and the prettiest with its Dubrovnik-esque medieval stone fortifications, palm trees, and peaceful swimming spots in easy walking distance. As in Brač, you can get a more local experience by staying in an apartment. Apartments Nina, for example, offers great hospitality and a rooftop terrace for breakfast overlooking the Adriatic. For a special occasion, splurge on a night in an opulent apartment in an 18th-century bishop’s palace within the old town. Regardless of where you stay, if you are in Korčula any time from mid-June to September, check out the town’s traditional Sword Dance Festival. Korčula has amazing little pizzerias and seafood restaurants — and some really scenic bike-riding and hiking opportunities. Rent a bike from Korčula town for a great day trip out to Račišce, a charming, sleepy little village nestled around a bay on the north coast. The eight-mile ride (each way) takes you along the coast past picturesque olive groves and vineyards. When you arrive in Račišce, settle in at Konoba Vala. Savor a well-earned glass of white wine — try the local variety, Pošip — and grilled fish as you look out onto the sea. The simplest way to reach Korčula is by the Krilo ferry, which departs Split twice a day, or Jadrolinija catamaran, which travels each afternoon from Split to Hvar and then on to Korčula town. Alternatively, take the ferry in the opposite direction, leaving from Dubrovnik in the morning. There are other Jadrolinija ferry connections, but they arrive in other ports on the island. That said, arriving at the pretty port town of Vela Luka on the far west of the island isn’t so bad, and you can connect to Korčula town on a scenic bus trip. 4. Šolta — Skip the crowds and explore sleepy fishing villages. A small, peaceful, and underrated island with a slower pace of life, Šolta is only nine nautical miles from Split. This tranquil island is known for its sleepy fishing villages, narrow lanes, and quiet beaches, and it’s the island to pick if you’re looking for a serene retreat well away from the crowds where relaxation is the number one aim. The island is forested and not very mountainous and is therefore great for exploring on foot or by bike, with plenty of marked paths and maps available from tourist information. Islanders are proud of their produce and want you to love it as much as they do. There are a few family-run agrotourism ventures inland where you can stay overnight. You can also just call in to sample local produce such as olives, wine, and even honey. Visit Tvrdic Honey to learn about beekeeping, tour the hives and taste the honey, or visit Kastelanac to try local produce and wine. The village of Maslinica on the west coast has the feel of an unspoiled fishing village. It’s a fabulous town to be based in, with its fresh seafood and five-star hotel situated in a 300-year-old castle. Its beaches are quite rocky, and there’s a gorgeous and unusual view of a little archipelago of islets just out to shore. The larger village of Stomorska has a pretty harbor and more budget-friendly apartments with panoramic ocean views. It also has a greater range of restaurants, including Konoba Nevera, where you should order the Dalmatian special black risotto. The great thing about Šolta is that there’s always a quiet beach within easy walking distance, no matter which village you stay in. You can get to Šolta in an hour by car ferry or in 30 minutes by catamaran. Public transport links on the island itself are relatively infrequent, but there are buses connecting the port town of Rogač through to other villages.